What’s the next line of the McMaster poem? You tell us! Hello and welcome to the McMaster poem! My name is Hal Niedzviecki and I’m the McMaster Writer-in-Residence. That means I spend most of my time on campus hiding out in a little office either writing stuff or talking to people about writing stuff. I thought it would be a good idea to come out of hiding and try something different: a giant poem that anyone (students, faculty, staff, alumni or friends) from the McMaster community can contribute to. The idea is to write the poem tweet by tweet, each line building on the last, to create a continuous narrative. Read CBC Hamilton’s story on the McMaster Poem. From Feb. 3-10, just send a tweet containing your lines and the hashtag #Macpoem. Your contribution to the poem will be automatically added. You are welcome to send multiple tweets if you want to keep adding to the poem. Everyone at McMaster knows how to write, and so by definition all of us are writers. You don’t have to be a poet to write poetry or anything else. Don’t over-think it, nobody is going to judge you, we’re all here to have fun and experience the poem’s many twists and turns. Whatever you want to happen next in the poem. Some poems rhyme, but many others don’t. Your contribution can take the form of rhyming couplets or free verse or any other kind of poetic writing that strikes your fancy. There really aren’t any. This is an experiment in collective creativity and I’m counting on the McMaster community to know what is and isn’t respectful. Be cool and don’t wreck the poem. Adhere to the general standards of campus respect and civility. I hope you’ll take the time to check it out and tweet a line or two! Hal Niedzviecki is the Mabel Pugh Taylor Writer-in-Residence, co-sponsored by McMaster’s Department of English and Cultural Studies and the Hamilton Public Library. Niedzviecki’s book The Peep Diaries was named as one of Oprah’s “25 Books You Can’t Put Down.” He is a writer, speaker, culture commentator and is the author of 8 books of fiction and non-fiction. He’s also the founder and publisher of Broken Pencil: the magazine of zine culture and the independent arts. 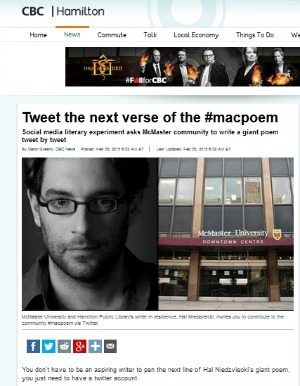 #macpoem is a collaboration between the Writer-in-Residence and the McMaster University Library.